Mnemonics are quick gimmicks that make some information more memorable. These are not the same thing as the memory systems, though, which are more complicated but also more effective. You have probably already learned a few of these tricks, even if you didn't know that's what they were called. Grammar: "I before E, except after C"
Biology: "Kids Pour Catsup Over Fat Green Spiders" (Groups in taxonomy - Kingdom, Phylum, Class, Order, Family, Genus, Species). Variations abound. A visitor named Robert, from UK, told me that his mnemonic for remembering the spectrum of visible light is "Richard Of York Gave Battle In Vain,". This is a historical reference to the failed attempt of King Richard III to defeat Henry Tudor, later Henry VII. So if a particular mnemonic doesn't work for you, feel free to change it or use a variation that does! Most mnemonic tricks like these fall into three categories: Acronyms, Acrostics, and Rhymes/Lyrics. Each of these are discussed below. If you don't care about the categories and just want to get started using them, just read the next section to learn how to do a Google search to find all you need. I could never list all the tricks for every subject. There are far too many, and new ones are being thought up all the time. You can search for specific subjects also. For example, if you are studying medicine, type "medical mnemonics" in the Google search box. Websites like MedicalMnemonics.com appear in the search results which has lots of medicine-related tricks you can use. The point is that whatever your subject, just do a Google search to find websites that have lots of those types of mnemonic tricks listed. So here's a little more information about each category. This is useful to know if you want to start making up your own. Acronyms are the "ROY G. BIV" type. Acronyms work especially well if the first letters of your list work happen to look like a word. If not, you're stuck with a real "acronym" (a random group of letters). For example, suppose you need to remember to buy tomatoes, zucchini, milk, green beans, and cereal at the store. Taking the first letters of your grocery list results in "TZMGC". Saying "T-Z-M-G-C" to yourself over and over might be enough to remember the list for a few minutes, but if you forget whether "T" stands for tomatoes or tortellini, you're out of luck. The acronym method works better if the letters form a real word. An example might be an acronym for the three types of logical reasoning: abduction, induction, and deduction. Notice that joining the first letter of each word spells the word "aid". Remembering the acronym AID may aid you in remembering the three types! Acrostics are somewhat similar to the acronyms. But instead of just remembering the first letters of the items in the list, you take each first letter and create a word. Then you string the words into a silly (and easy-to-remember) sentence. A good example is the following trick for remembering the biological groupings in taxonomy: "Kids Pour Catsup Over Fat Green Spiders". The first letter of each word in this sentence remind you that the groups are Kingdom, Phylum, Class, Order, Family, Genus, Species. I like this one, and it works as a memory aid. But if you have information to remember that doesn't already have an established "silly sentence" for it, you can spend a lot of time fiddling around trying to think of one. This method also doesn't work for remembering other types of information, such as people's names, vocabulary definitions, and so on. You know how you call always remember the lyrics for that favorite song whenever it is played on the radio? One reason is that the music itself is a memory aid. Try remembering the lyrics to a song while not listening to the music - it's much harder. So if you're really musical, perhaps you can write a little song for everything you want to remember. That seems like a lot of work to me. However, for some things rhymes or lyrics have already been thought of. Go ahead an use these if you like. 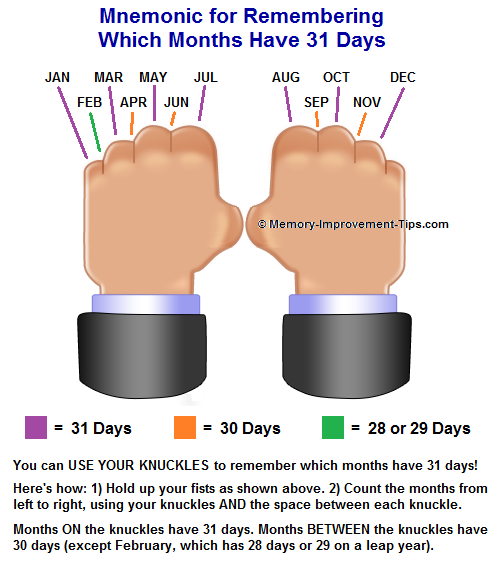 A good example might be the rhyme for remembering which months of the year have 30 or 31 days: "Thirty days hath September, April, June, and November; all the rest have 31 (except February)". The rhymes that are out there might be useful for remembering very limited types of information. Certainly, though, you can't base your ability to memorize every type of information on this one. As you can see from the examples above, mnemonic tricks are definitely helpful in specific situations. The memory systems are the real miracles, though. Image-based memory systems like the Keyword Method, Link Method, and Peg Method can help you memorize almost any kind of material. Give them a try!